�cole Tuxedo Park is a small, quaint French Immersion centre nestled in old Tuxedo, an affluent community in Winnipeg, Manitoba. The original school was built in 1926 and two wings were added in the 1950s. It has eight classrooms currently housing 160 students from kindergarten to grade six. A ninth classroom is leased to a day care that provides an after school program and a bilingual pre-kindergarten program. The teacher count is fourteen: eight classroom teachers and six specialists. The school, due to its size, lends itself to a family atmosphere where everyone knows your name. In 1984 Tuxedo Park School closed its doors and �cole Tuxedo Park became the only French Immersion milieu in the legacy School Division [Ed. note: school district] of Assiniboine South. �cole Tuxedo Park is situated in the established area of Tuxedo but its school boundaries included most of the Division. The student population grew by leaps and bounds during the years of 1984 to 1987. By 1991, its boundaries were reduced due to new French Immersion programs opening in the other sections of the Division. With its reduced school boundaries, only 12 students enrolled in the kindergarten class. This enrolment pattern repeated itself in 1992. The school was slated for closure. In 1992-1993 the Parent Council waged an all out campaign to save the school. The public relations campaign, which marketed our many charms, included advertising in the Winnipeg Free Press, in the community paper, and on billboards. Pamphlets were prepared, printed and distributed to all day cares, nursery schools and real estate agencies. Parents spent many weekends at various shopping centers talking to prospective clients of our little school. Open houses were also organized and potential students were invited to come and visit during the school day. Between 1993-1998, our school population increased exponentially due to our successful marketing campaign. Parents of kindergarten age children would line up for kindergarten registration prior to 5:00 am to ensure that their child would be admitted to our school. Our publicity drive resulted in a full kindergarten class and it extended to two classes when the school could accommodate the students. We promoted an open, friendly and welcoming atmosphere. Our successful marketing strategies resulted in �cole Tuxedo Park being removed from the endangered list in 1998. Our little school was saved. Currently, we are accepting kindergarten registrations at the parents' discretion. One parent registered her child two weeks after his birth. We now have a full school and a waiting list of students for our kindergarten program. Our efforts were successful and the public relations plan continues to ensure the viability of �cole Tuxedo Park. After the parent community realized that we would not be closing in the foreseeable future, they turned their attention to improving our physical space. Our indoor and outdoor spaces needed revamping. The school's appearance had not truly changed for over fifty years. Several subcommittees were formed to undertake the tasks of major improvements. One subcommittee assumed the task of building an outdoor classroom that would reflect our educational beliefs related to the environment. In recognition of our outstanding participation in 2001, the Canadian Wildlife Federation through their National Wildlife Week Award Programme awarded �cole Tuxedo Park School a National Honourable Mention. Another group of parents undertook the project of beautifying our indoor space as it needed a new paint job, cupboards built, bulletin boards hung, flooring replaced and repairs to our infrastructure. During the summer of 2002, teams of parents were seen at the school painting and overseeing renovations. The Indoorspace Committee continues to beautify our space. Finally, a third subgroup of the Parent Council undertook to remove our aging play structure and replace it with a new structure that meets safety codes. Our parent community donates time, expertise and money to make our school successful and a better place for the students. For their successes and devotion to the school, our parent community was the recipient of the Premier's Volunteer Service Award for 2003. Apart from these major projects, our parent community has always done what was required to meet the needs of a busy school. Close to seventy-five percent of our parents volunteer in some way. One committee that is most influential in setting school priorities is our School Planning Committee. This committee was established in 1996 when we opened our doors to parental input on school improvement. The School Planning Committee, whose membership includes parent and teacher representatives, meets regularly between October and May. Its mandate is to discuss, plan, facilitate and monitor the implementation of the annual school plan. Its second mandate is to determine possible goals for the following year to ensure continuous improvement. In September 2001, I had the privilege of being invited to a session hosted by Canadian Parents for French at which they presented their School Assessment Tool. This assessment tool was designed to encourage communication among stakeholders about the functioning of French Second language (FSL) programs in local communities and to help identify FSL program strengths and weaknesses. What impressed me the most about this self-assessment tool was that it was intended to provide a positive, collaborative experience that would benefit parents, teachers and students. The emphasis of this assessment was that all participants must be committed to engaging in a positive dialogue and to working for positive change. This was not to be a forum to criticize teachers, parents, or principals, nor was the result to be used to compare schools. I was sold on this assessment tool. For many years, the School Planning Committee had developed various tools to collect important information from our parent community on how well we were doing and which areas needed improvement. We had assessed various aspects of the curriculum and school climate but never had we looked at our French Immersion program as a whole. It was time to evaluate our second language program. We needed to celebrate our successes, identify areas for school improvement, set our priorities and make certain that all stakeholders were involved. The following questions needed to be asked and answered: "What is the status of our French Second Language program?" and "Where do we want to be?" 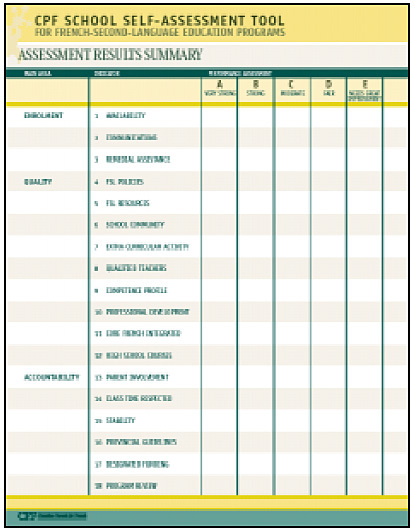 The School Assessment Tool was presented to the School Planning Committee in October of 2001. Its function, timeliness, and how it would provide us with the building blocks of an action plan for school improvement were explored. We were ready to assess the program and this was the tool we needed. After some discussion on the merit of the self-assessment tool, and after accessing the Canadian Parents for French (CPF) website that supplied us with a list of contacts and other pertinent information, we decided to incorporate it into our planning process. The committee put a three-step planning process in place. Our first step was to organize a focus meeting to assess our school's performance in three areas: enrolment, program quality, and accountability. Several questions arose that needed careful consideration and discussion: What kind of discussion group will it be? Who will chair it? What ground rules are needed? The committee decided to hire an outside facilitator to chair the meeting, which would enable the committee members to be active participants to the discussion. It was also thought that an outside facilitator could avoid confrontational issues more adroitly than the principal or committee chair. The number of recipients would determine the configuration of the focus group. Step two was to identify our stakeholders. Who are we going to inviteparents, teachers, community? Will students be included? It was decided that parents and all staff members, including paraprofessionals, secretary, and custodians would be invited. Students in our school were too young to be able to respond appropriately to the indicators; therefore, they would not be invited to actively participate in the process. A formal invitation went out to the whole community. The meeting was advertised extensively in the school newsletters, discussed at several Parent Council meetings, and informal invitations were extended during hallway discussions. The message was very clear, and all interested parents and staff were welcomed to join us in this very worthwhile discussion. Finally, step three was to consider our time requirement and to determine which questions were pertinent to our school. Sixteen of the eighteen indicators were selected that met our criteria. The rating scale developed by CPF was modified from five points (very strong, strong, moderate, fair, needs great improvement) to two points (strengths and areas for enhancement). As for the time requirement, we left it to the facilitator to decide how he was going to manage the time. On Tuesday evening April 9, 2002 from 7:30 to 9:00 representative parents and teachers met as a focus group to process the Canadian Parents for French Self-assessment Tool for French Second Language Programs. The group consisted of a fair representation from the two stakeholder groups but the numbers determined that the discussion would be large group only. Smaller groups were not needed to receive more specific feedback. The parents present did a superb job of pinpointing strengths and areas for enhancement under each of the sixteen indicators. In turn, the staff and the principal clarified and explained background, policies and realities that are imposed on the school system. As well, the staff representatives acknowledged excellent points and made notes to incorporate them into the school goals. It was all done in the spirit of collaboration. The discussion was lively and respectful. In May of 2002, the committee met with the whole staff to present the feedback gleaned from the focus meeting and make recommendations for the School Plan 2002-2003. The focus group indicated satisfaction with how well we communicated to our community and how we promoted the program. They indicated dissatisfaction with the availability of busing. It was decided that they would present their concerns to the School Board. As a result of this intervention from parents, every attempt was made to meet our busing needs. This tool should be separated into two parts: school-based and division-based. I often found myself recommending that parents contact the Superintendent's office to discuss issues we could not address at the school level. Parents became more aware of how school divisions grapple with French Immersion programming. the proper use of all government funding designated for FSL programs (question #17). The five point rating scale was too specific. The School Planning Committee realized early on that this was not going to work for us. We felt more comfortable using a two point system: these are our strengths and these are areas for enhancement. The tool needs to be adapted to a community's particular needs and circumstances. At �cole Tuxedo Park we are fortunate to have a very supportive community. We work together for the betterment of the children. Is this true for all schools?